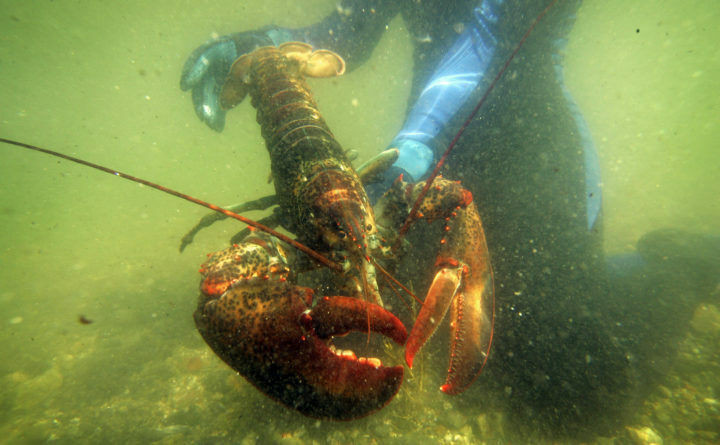 In this July 2007, file photo, a scientist holds a lobster underwater on Friendship Long Island, Maine. A study published on Monday, Jan. 22, 2018, said conservation practices have allowed the northern New England lobster industry, backbone of Maine's economy, to thrive in the face of rising ocean temperatures. Meanwhile, another study predicts the population will drop by as much as two-thirds within the next 30 years. The lobster population in the Gulf of Maine could decline by nearly two-thirds by 2050, according to a scientific study released this week. As bad as that sounds, scientists and industry representatives say the demise of the most valuable single-species fishery in the country is unlikely. “It doesn’t mean Maine’s lobster fishery is doomed,” said Andrew Pershing, chief scientific officer at Gulf of Maine Research Institute and a co-author of the study. The predicted decline was included in the results of a study conducted by GMRI and other research groups about the effect of conservation measures on lobster fisheries in the Gulf of Maine and off the southern New England coast. The lobster population could decline between 40 percent and 62 percent over the next 32 years, depending on how much waters continue to warm in the Gulf of Maine, researchers found. The total stock of lobster for the Gulf of Maine and Georges Bank is in the neighborhood of 300 million lobsters, according to the most recent stock assessment by Atlantic States Marine Fisheries Commission. The study found that lobster conservation measures in Maine aimed at protecting reproductive females and oversize adult lobsters in general, which date back to the early 20th century, have helped amplify the temporary benefit of warming seas to the lobster population in the gulf, which is warming more quickly than 99.9 percent of the world’s oceans. In comparison, the lack of similar measures in southern New England hurt the lobster population south of Cape Cod now that waters there have become too warm to help support the growth of juvenile lobsters. “Maintaining measures to preserve large reproductive females can mitigate negative impacts of warming on the Gulf of Maine lobster fishery in future decades,” researchers wrote in the study, which was published Jan. 22 in the scientific journal Proceedings of the National Academy of Sciences. If the gulf’s lobster population does drop by 40 or even 60 percent over the next 32 years, the decline will be more gradual than the boom that preceded it. At that decrease, the gulf’s average lobster populations would be “similar to those in the early 2000s,” GMRI officials said. From 1997 through 2008, Maine’s annual harvests fluctuated between 47 million and 75 million pounds. It is only within the past 10 years, since Maine lobstermen harvested 64 million pounds in 2007, that statewide landings have doubled. The gulf’s estimated population in the early and mid-2000s was roughly around 150 million pounds, according to ASMFC data. For years, lobster fishermen, scientists and regulators have acknowledged that the lobster population boom in the Gulf of Maine over the past 30 years will reverse course, more likely sooner than later. The collapse of the lobster fishery south of Cape Cod and the fact that booms never last forever have been a regular part of industry discussions in Maine, even as the state’s annual harvests have increased almost every year. From the end of World War II through the 1980s, the annual statewide harvest in Maine was always between 15 million and 25 million pounds. But since the 1990s, when overfishing caused the gulf’s cod stocks to collapse and warming water boosted the survival rate of juvenile lobsters, they have risen dramatically, hitting a record of 130 million pounds in 2016. The study does not make any predictions about how much Maine’s annual lobster harvest will decline by 2050, but if the population drops by 40 to 60 percent, landings most likely will decline significantly as well, Pershing said. But declines in catch however, do not always mean lower fishing revenues. Lobstermen have become accustomed to dealing with significant changes in the price they get for their catch. From 2005 to 2012, the average annual price paid to fishermen dropped by 58 percent, from $4.63 per pound to $2.69, but rose back above $4 again in 2015 and 2016. Catch and price data for 2017 is not yet available, though fishermen have predicted the value of last year’s statewide harvest will be the lowest this decade. To try to minimize such price swings, and to insulate fishermen from the expected decline in catch volume, the state Maine Lobster Marketing Collaborative has made a recent effort to boost demand for Maine lobster, and the value of the fishery, by marketing it as a high-end culinary product, rather than as an everyday staple. Regardless of price fluctuations, regular scientific surveys on different life stages of the current lobster population in the gulf indicate that the resource is likely to be in good shape for the next several years — at least until the current class of baby lobsters grow to harvest size, which generally takes 7 or 8 years, said Patrice McCarron, executive director of Maine Lobstermen’s Association. Beyond that time frame, she added, fishermen are not making immediate assumptions. No one predicted 30 years ago that there would be a huge increase in catch volume, she added, and trying to predict what might happen 30 years from now seems equally uncertain. “There remains a lot of optimism in the near-term future for this fishery,” she said.